It’s not the mistake that matters – it’s lying about the mistake that will come back to haunt you. This analysis of the failure in Crisis Communications at The Environment Agency tells an age-old story. 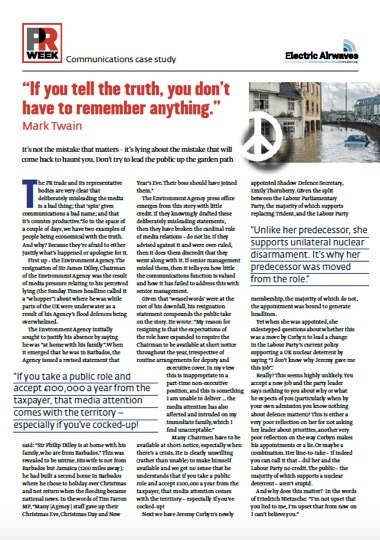 The PR trade and its representative bodies are very clear that deliberately misleading the media is a bad thing; that ‘spin’ gives communications a bad name; and that it’s counter-productive.”So in the space of a couple of days, we have two examples of people being economical with the truth. And why? Because they’re afraid to either justify what’s happened or apologise for it. First up – the Environment Agency. The resignation of Sir James Dilley, Chairman of the Environment Agency was the result of media pressure relating to his perceived lying (the Sunday Times headline called it a “whopper”) about where he was while parts of the UK were under water as a result of his Agency’s flood defences being overwhelmed. Download The Environment Agency case study here. Electric Airwaves is the leading provider of Media Training, Communications Skills Training and Crisis Communications Skill training. With the largest team of trainers, the deepest knowledge base and some of the world’s leading organisations as clients, we are well placed to help you manage your reputation – in good times and in bad. Or contact us on team@electricairwaves.com to discuss your needs in detail.